Craig Stephenson is a marvel. 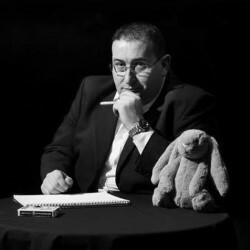 His new Edinburgh Fringe show, Deception, is a delightful mix of magic, mentalism and menagerie. Stephenson asserts throughout the show that he does not actually read minds, and his skills are merely an astute mix of observation and heightened awareness. However, the feats which Stephenson presents are truly fantastic. A consummate performer and engaging showman, Stephenson in turn delighted and enthralled his full theatre. His banter was delivered in a friendly, personable manner, which added to the overall effect, and put the audience (as well as several volunteers) at ease, making them eager to participate throughout the show. And don’t forget Stephenson’s bunny assistant – Mr. B added a whimsical element to an already charming and delightful hour. An Edinburgh Fringe must-see!